Fog may impact flights arriving and departing Canberra Airport causing delays. It is more prevalent in the winter. If the airport is fogged in, please contact your airline directly for flight updates. As a general rule, even if there is evidence of fog at the airport, passengers should still go to the airport and check-in for their flight at the appropriate time. Fog is not consistent and in some cases isolated aircraft are able to land, and then depart shortly thereafter, even though other flights are delayed or cancelled. Which flights are most affected? The major impact on aircraft operations from a heavy fog is aircraft arriving in the morning (typically before 9am), and the flow-on effect on departing flights using these same aircraft. In almost all cases, aircraft parked overnight at Canberra Airport are able to depart on schedule, subject to the airlines’ and pilots’ decisions. This generally applies to all flights scheduled to depart Canberra before 8am. While there is never a total guarantee that you can avoid a fog or any other sort of delay, the following may assist in planning flights to and from Canberra, especially over winter. If you are travelling to Canberra during the winter months, book an afternoon or evening flight to Canberra and stay overnight. If you are travelling from Canberra in the morning, there is a significantly lower chance of being delayed by fog if you book a seat on an aircraft that has stayed overnight at Canberra Airport. This applies to most flights scheduled to depart Canberra before 8am. Otherwise, book on an afternoon or evening flight from Canberra. Note that the only way to guarantee no fog delays is to travel the night before. Canberra Airport has installed additional airfield ground lighting system that assists both landing and departing aircraft . The new Category II lighting system provides better visibility for pilots and allows them to get closer to the runway during attempts to land. The system includes new touch down and runway centreline lights and enhanced back up reliability. It enables pilots to get to 100 feet off the ground before deciding whether they can land. For passengers, this will mean less delays due to adverse weather conditions such as fog. What flights are affected by fog? In almost all cases, aircraft parked overnight at Canberra Airport are able to depart to their destinations on schedule, subject to the airlines' and pilots' decisions. Of course, airline schedules are subject to change and flights may be cancelled when fog is forecast. If this occurs, your airline will notify you and for the latest information on schedules and fog-related impacts always contact your airline directly. If Canberra Airport is fogged in, what should I do about my flight? In the first instance, you must always contact your airline for information on flight arrivals and departures. However, as a general rule, even if there is evidence of fog at the airport, passengers should still go to the airport and check-in for their flight at the appropriate time, or risk being offloaded when the flight actually does depart. When there is fog impact, airlines will often combine flights on larger aircraft or reallocate aircraft operating a specific flight. Customers should be at the airport to ensure they are informed of any such changes and available to board an aircraft at any time. I have an important meeting - how can I avoid the risk of delay due to fog? If you are travelling to Canberra, during the winter months, book an afternoon or evening flight to Canberra and stay overnight. The flights that are typically most impacted from any fog are those scheduled to arrive between 6am and 10am. If you are travelling from Canberra in the morning, there is a significantly lower chance of being delayed by fog if you book a seat on an aircraft that has stayed overnight at Canberra Airport. This applies to all flights scheduled to depart Canberra before 8am. Otherwise, book on an afternoon or evening flight from Canberra. Note that the only way to guarantee no fog delays is to travel the night before. 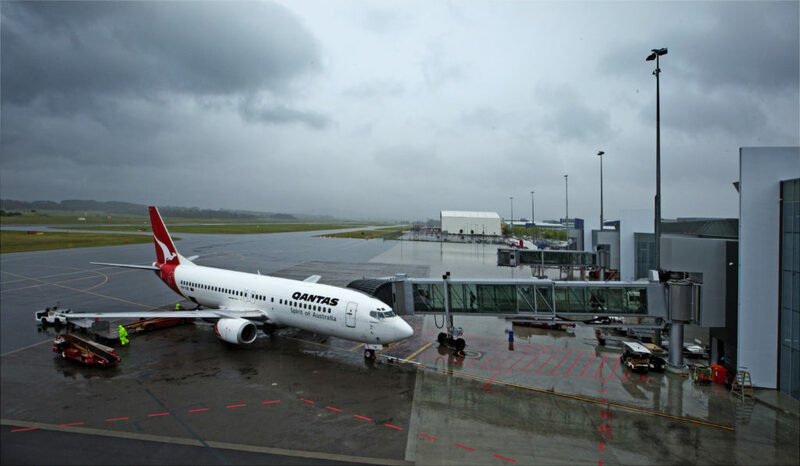 What is Canberra Airport doing about fog and reducing delays to aircraft? The Instrument Landing System (ILS) installed at Canberra Airport on Runway 35 (landing from the south) allows aircraft to land in low visibility conditions. In 2004 Canberra Airport worked with Airservices Australia to lower the height above ground at which a pilot must be able to see the runway lighting from 330 feet to 230 feet. This has already had a big impact on reducing fog delays. We have worked with Airservices to further reduce this to 200 feet - this was delivered in 2007. In early 2012 Airservices Australia undertook a major upgrade of the ILS System to provide a state-of-the-art landing system that is more accurate and reliable. The new ILS is capable of providing more accuracy and a lower height above ground at which a pilot must be able to see runway lighting for landing. Canberra Airport is also working with the Civil Aviation Safety Authority (CASA), Airservices Australia, the major airlines and the Royal Australian Air Force (RAAF) to achieve further reductions in the ILS decision height for some passenger jet aircraft to as low as 100 feet above ground. New precision approaches, known as Required Navigation Performance (RNP), are for the first time allowing low-visibility approaches from the north (Runway 17) for certain new generation B737 jet aircraft, which provides greater flexibility to airlines in low-visibility conditions (especially when fog is thicker to the south). This technology is expected to be expanded over the coming years, with larger number of aircraft equipped, as well as greater capabilities to land in low-visibility conditions. Please contact Canberra Airport if you wish to discuss any of these matters with us further.